Water woes - Little Country. Big Adventure. I can now carry a full bucket of water on my head without spilling a drop. It is actually much easier than waddling the few dozen meters from the tap to my compound with the bucket awkwardly in-hand. The handle dug into my palms and I typically had to switch arms twice in the 2-minute walk, all while sloshing part most of the precious water into the dirt. Did you know a gallon of water weighs nearly 10 pounds? I’d put a bucket at three gallons. You do the math. Fetching water has definitely been the most difficult adjustment in moving to my new home. During training, my family had a tap in their compound that was turned on 24 hours a day. Now, the tap is down the road and has no set hours for when it functions. It is solar so it typically turns on during the hottest part of the day, but with it being rainy season, even afternoons are hit and miss and sometimes the water barely trickles out. Still, I’m lucky it’s not a well with a hand pump. This is a big issue in my community. For 400 compounds, there are only 16 taps and one working hand pump. There are some open pulley wells but those aren’t safe to drink from. Women sometimes wait in line all day at the tap to fetch water. Luckily, I am close to one of the taps and I walk home from school for lunch and then I fetch two buckets of water nearly every day, which is enough for me to cook, wash dishes, take a few baths and filter for drinking. If I really skimp, then I can sometimes make the water last two days. But more often than not, if I try to stretch it I end up not having quite enough before I can get to the tap for more. Laundry day is pretty much my worst nightmare because it requires so much water. Plus, I have to do laundry first thing in the morning for any chance the clothes will actually dry. That means planning when I’m going to wash clothes, so I can fetch the water the afternoon before. I do laundry in two huge, wide buckets which are far too heavy for me to carry. My sisters will fetch it for me, but I hate adding to their already full workload. So if they don’t insist on letting them help, I make several trips with small buckets to fill the big ones. Half the time, I still end up estimating incorrectly and not having enough water to rinse the soap out of my clothes. So then I have to let them soak another day and rinse after I can fetch more water. I’m such an amateur! Even my four-year-old sister can carry a bucket on her head without spilling and my seventh grade sister can carry the big laundry buckets full to the brim. Gambian girls fetch water for their entire families and always seem to have enough. 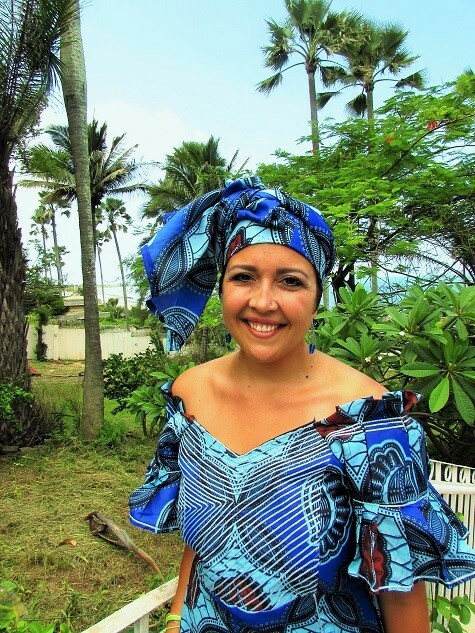 This is just one example of the incredible strength Gambian women possess. Although I’m still no expert, I have managed to make water conservation an art. With no hair, I usually bathe with six or seven cups of water, but I can get clean in two if I have to. I eat out of the pot so as not to dirty a bowl. If I strain pasta, I drain the water and reuse it to wash the dirty dishes. During a heavy rain fall, I position my big buckets under the roof to catch the run-off and save it for laundry. I’m getting so good at this water business, all the neighbors gawk and clap for me when I walk home with a bucket on my head! That is why they are clapping, right? 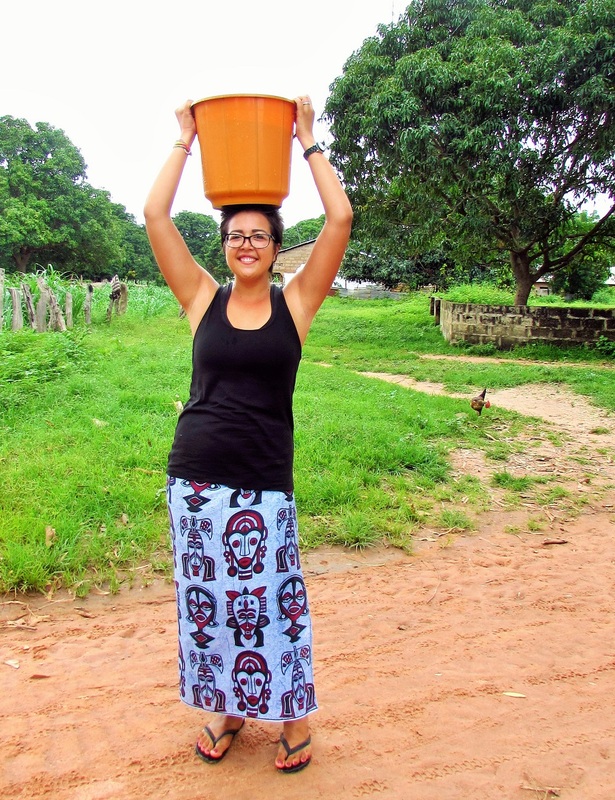 See, Jess, those long arms of yours turned out to be great for carrying a bucket of water on your head! LOL Seriously, though, I think I have taught you a few things that must surely be helping you there as I usually see a smile on your face:) 1. The glass IS half full. 2. When you think things are tough for you…I guarantee it’s even tougher for someone else. 3. Always try to find that silver lining. 4. There is joy in helping others and you are such a gift. 5. ALWAYS find a reason to smile…as your Uncle Rob would say, “LIFE IS GOOD!” I love you and miss you tons! Wow, Jessica! I am so amazed at all the tasks you are now able to do, and so grateful that I never had to do them! Seriously, it doesn’t surprise me that you have conquered every obstacle and still can smile! Take care.